Land claims and related documents concerning the Elko Colony from 1907-1926. Copied from other archives. Includes handwritten documents. 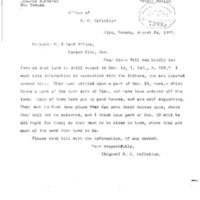 Letter to U.S. Claims office requesting what land lots remained vacant in the Elko Colony.